Three past and present Trinidad and Tobago internationals were ejected while a fourth left the Hasely Crawford Stadium with blood gushing from his nose in an eventful Pro League double header in Port of Spain yesterday. When the dust settled, Police FC and Caledonia AIA had most to feel pleased about as they climbed to second and third place respectively. 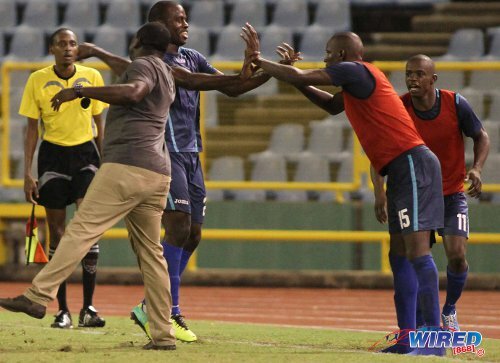 Photo: Police coach Richard Hood (left) tries to join the celebrations while Elijah Belgrave (centre) is congratulated by substitute Jameel Perry during a previous Pro League fixture. 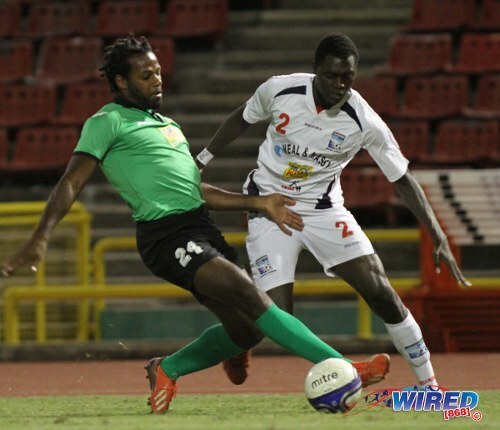 The 10-man “Eastern Stallions” got the evening’s only goal as veteran right back Kareem “Tiny” Joseph grabbed an 88th minute winner against San Juan Jabloteh while Police and Central played to a goalless draw after losing a player each to straight red cards. 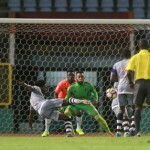 For Central, who started with six January signings, it was a fourth successive draw while the Couva-based club’s only League win since last October has come against table proppers, St Ann’s Rangers. 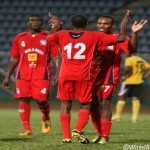 Police goalkeeper Adrian Foncette kept the “Lawmen” level with fine first half saves off Jamal Jack and Willis Plaza. Sean De Silva, who started in place of suspended veteran Marvin Oliver, conjured up both opportunities with precise free kicks. But the game’s defining moment came in the closing seconds of the first half as referee Keon Yorke temporarily lost control of the proceedings. Central and Trinidad and Tobago international playmaker Ataullah Guerra had already been booked when he clattered teenage Police winger Joel Lewis right in front the opposing bench. 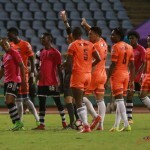 The Lawmen were convinced that Guerra threw an elbow and ex-“Soca Warrior” midfielder Trent Noel grabbed the referee by his arm to make the point. Yorke flashed red at Noel for his trouble while Guerra, who spent much of the evening arguing with the official, was next. Photo: Central FC striker Dwight Quintero (centre) goes down over a tackle from Police defender Anton Hutchinson (far right). Looking on is Police captain Todd Ryan (far left) and Kenaz Williams (second from right). Yet Yorke missed a more straightforward decision in the 71st minute as Police striker Jameel Perry was played clear through the opposing defence only to be dragged to the ground by Central’s Elton John. The referee failed to award a free kick; let alone the obligatory red card. Substitutes Johan Peltier (Central) and Elijah Belgrave (Police) both went close but the score remained goalless at the final whistle. There was controversy and blood-letting in the closing match of the double header as well. 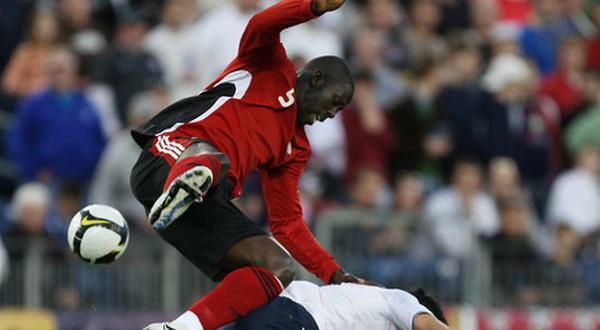 Caledonia’s 2013 Gold Cup forward Jamal Gay left the field early in the second half with a suspected broken nose after a collision in the penalty area while the Stallions’ 2006 World Cup midfielder Densill Theobald saw straight red after a clash with Jabloteh substitute Neil Mitchell. A distraught Theobald insisted after the final whistle that he intends to appeal an unjust dismissal. 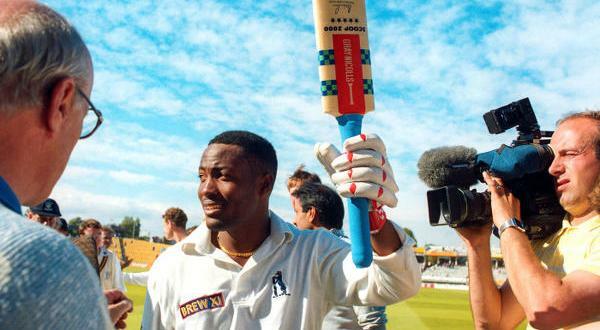 The veteran playmaker had stolen possession from Mitchell and he claimed to have thrust his arm out to protect the ball. Mitchell ran into the arm and went down and referee Gyasi McDonald ruled that Theobald had been reckless or malicious in his actions. Photo: San Juan Jabloteh defender Kareem Smith (left) tries to keep the ball from Caledonia AIA defender Aubrey David. Ironically, McDonald had earlier riled Jabloteh fans too when he ignored a plausible penalty appeal after Theobald barged over the prolific opposing captain, Kerry Baptiste, in the 18-yard box. But there could be no debating the validity of Joseph’s winner in the 88th minute although it was possibly harsh on Jabloteh. Nathan Lewis broke clear down the right flank and Keyon Edwards controlled his cross and drove past Jabloteh goalkeeper Shane Mattis. But Keino Goodridge spotted the danger and cleared off the goalline. Not far enough though. Caledonia substitute Nical Stephens pounced on the loose ball and unleashed a fierce drive which Mattis managed to fend away. And, just when Jabloteh felt it had weathered the storm, up popped “Tiny” to force his effort past Mattis for the three points. Caledonia is now joint third with Point Fortin Civic and North East Stars and one point off second place Police although the Stallions have a game in hand. Photo: San Juan Jabloteh midfielder Jevon Morris (second from right) tackles Caledonia AIA debutante Jameel “Shoter” Neptune (centre). 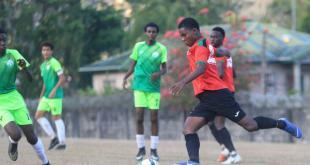 Looking on are Jabloteh players Dario Holmes (far right) and Jelani Felix (far left). 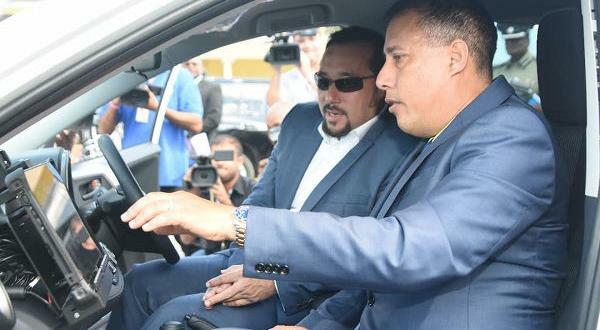 Civic can make its own case for the crucial Pro League second spot—which comes with an automatic berth for the 2015 CONCACAF Champions League qualifying rounds—when it hosts runaway leaders, DIRECTV W Connection, from 3.30 pm today at the Mahaica Oval. Police FC (4-3-3): 18.Adrian Foncette (GK); 19.Christon Thomas, 2.Jasimar Ashers, 5.Anton Hutchinson, 17.Dexter Alleyne, 6.Kenaz Williams, 21.Todd Ryan (captain), 10.Trent Noel, 11.Kareem Perry (20.Elijah Belgrave 68), 39.Joel Lewis (27.Clevon McFee 68), 15.Jameel Perry (8.Akiba Peters 78). Unused substitutes: 30.Keston Mata (GK), 1.Errol Charles, 12.Vernell Ramirez, 25.Kemron Purcell. Central FC (4-2-3-1): 21.Jan-Michael Williams (GK); 12.Jamal Jack, 2.Elton John, 50.Yohance Marshall, 27.Samuel Delice; 4.Sean De Silva (13.Johan Peltier 46), 6.Leston Paul; 7.Jason Marcano, 45.Ataullah Guerra, 17.Rundell Winchester (9.Dwight Quintero 67); 1.Willis Plaza. Unused substitutes: 25.Javon Sample (GK), 11.Darren Mitchell, 15.Kaydion Gabriel, 22.Keon Trim, 24.Akeem Benjamin.